Filipinos are crying foul when the organizing committee of the Asia Pacific Economic Cooperation Summit in Sydney, Australia called the Philippines' male national costume; Barong Tagalog, as a mere peasant's shirt. Apparently, our national pride took a stabbing as it further stated that the Filipinos were forced by the Spaniards to wear it because of its translucency. With no pockets and worm untucked, so the Spaniards could see that the wearer was not able to conceal any weapons under the garment. But, this theory has been questioned by other scholars and historians. They note the absence of a citation to the specific law where the Spaniards supposedly prohibited the natives from tucking in their shirts. Secondly, they note that natives during the Spanish Era wore their shirts tucked at times. 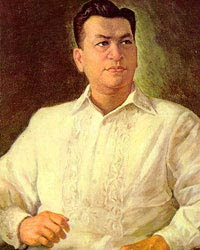 A common example cited in support of this argument is Jose Rizal and his contemporaries, who were photographed in Western clothing with their shirts tucked, although the era of the barong predated Rizal's time. Thirdly, the Philippines is a tropical country, and it is common for shirts worn untucked because of the hot climate. Finally, the barong is thought to be either the local adaptation or the precursor to the guayabera, a shirt popular in the Latin American communities. According to those who claim that the barong is the precursor of the guayabera, the guayabera shirt was originally called "Filipina" during the era of Manila Galleon tradeships when it was brought to Mexico from the Philippines. "It’s very important that the clarification be made. I’m not sure about the origin personally but at the moment it’s is practically the people in high society and government, this national costume is being used by heads of state," said Press Secretary Ignacio Bunye, himself a delegate to the summit. Well, the damage has been done. Once again, an idiotic person in charge or in power opened their mouth, said something they hardly know a thing about without at least reading a little about the subject, made a comment without thinking of the consequences of what his words may have impact on. The only thing that pisses me off is the completely hypocrisy of the people who are "supposedly" raising hellfire about this, trying to defend national pride. Local politicians hardly wear the Barong Tagalog, damn it! Look at our congress and senate, they always wear those 3 piece Americanas and suits. Men working in high positions don't wear it either. It is a common joke that the only ones wearing the Barong Tagalog are their bodyguards and drivers. If you ask an ordinary pinoy teenager about what they think of the Barong Tagalog as a garment. Not worthy of being worn as a shirt of status or symbol, fit only for those rare occasions like weddings, funerals, baptisms. Where if you are rich you would probably be sporting a suit, but since you can't afford it the simple Barong will do. Whether we admit it or not, we pinoys know that the Barong Tagalog did start off as A PEASANT SHIRT. It is a peasant's shirt! And the people who have no idea what a barong tagalog is and reads this article would forever link it to a peasant's shirt. If this is considered damaging to our country's national costume's image, then there is nothing now that we could do. The news is already out there. The best we could possibly do is spin it off to our advantage. Though, it did start off as a peasant's shirt, once a sign of one's low status in society, it rose above the ranks to become a symbol of equality. Inspiring and reminding its wearers to rise above the rest and never forget about their origin. The wordings may need to be changed a little but you get the idea. Where Is The Honour in "Honour Killings"? Tag And This Time I'm It!